Animal blood, algae and mushroom mycelium are among some of the unconventional materials used in design this year. Continuing our review of 2017, editorial assistant Gunseli Yalcinkaya selects her top 10. 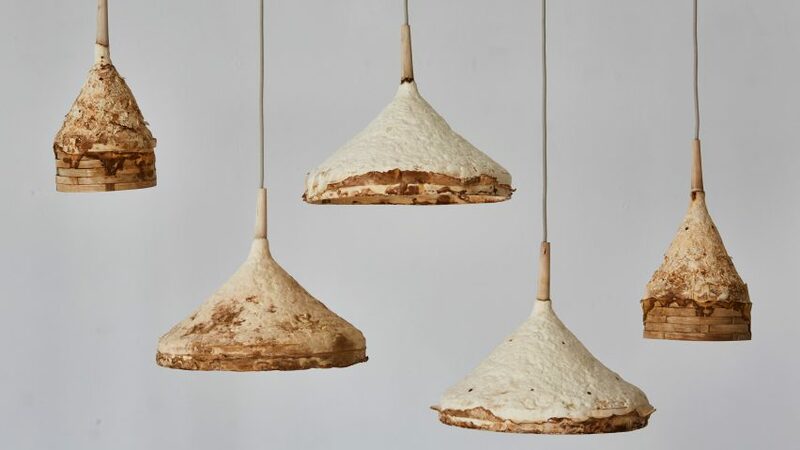 In 2017, a number of designers explored the structural properties of new, environmentally friendly materials – but mushroom mycelium was one of the most unusual. It was used to cover an arching pavilion in India and to create a tree-shaped self-supporting structure in South Korea. British furniture-maker Sebastian Cox also started using the material, unveiling a collection of suede-like lamps he created in collaboration with researcher Ninela Ivanova. Ocean plastic emerged as a material a few years back, but it really exploded in 2017 – as more and more designers became aware of the amount of waste plastic in the oceans. Top ocean plastic designs of 2017 include a range of garments and footwear by Adidas and "ocean terrazzo" furniture by Brodie Neill. The Dutch Water Authorities have developed a method of transforming wastewater into bioplastic. Delft-based designer Nienke Hoogvliet took advantage of the technique this year, creating a series of sustainable cremation urns. Named material of the year at London Design Fair 2017, Jesmonite is made by combining plaster and cement with a water-based resin. The material has become increasingly popular with designers, including Phil Cuttance, who used it to make patterned Herringbone objects, and Zuza Mengham, who combined it with British lichens to create angular sculptures. This year saw Slovakian designer Šimon Kern choose leaves as a manufacturing material. He combined the natural waste product with bio-resin from leftover cooking oil to create a chair. Another sustainable alternative to plastic food packaging is seagrass, as seen in Royal College of Art student Felix Pöttinger's biodegradable seagrass containers, made by binding dried seagrass extract with a cellulose-based extract from the plant. One of this year's least orthodox material choices has to be Design Academy Eindhoven graduate Billie van Katwijk's sustainable alternative to leather. The designer transforms cow stomachs into a material that can be used to make accessories and bags. Another Design Academy Eindhoven creation comes from graduate Basse Stittgen, who used blood leftover from the meat industry to create a collection of small objects, from a jewellery box to an eggcup. The process was done by drying out blood to create a powder – a process common in the making of black pudding. The powder was then heated and pressed to create a solid material. The potential of algae as a sustainable crop of the future was explored by many designers in 2017. IKEA's research lab Space10 created an algae dome, which it described as a "food-producing architecture pavilion". Similarly, Dutch designers Eric Klarenbeek and Maartje Dros developed a bioplastic made from algae and used it to make a series of vases. The pair believe that plastic made from algae could completely replace synthetic plastics over time. Known for its lightweight and durable qualities, carbon fibre is commonly used in the production of cars and bicycles, such as the Hummingbird bike launched this year. But it was this year also used for a variety of other uses. It provided the large filigreed shutters for an Apple Store in Dubai, formed a lightweight chair designed by Thomas Missé, and was used to build a woven pavilion based on the silk hammocks made by moth larvae. Wanting to explore alternative possibilities of discarded materials, Korean designer Oh Geon created this sculptural stool from a mixture of leftover walnut and oak chips.